It was never ever about Aaron being ready - it was me! It was always about me! Now, kicking and screaming, I am reluctantly ready. Hey in 7 days he will be 28 months!!!!! It is - to be honest - about time too! My Great Aunt who is normally "don't worry! Don't worry!" about most things even told me my cousin, who herself is now nearly 50, was being toilet trained at 11 months and dry by 13 months. Eeek, so 2 generations before me, my family was more efficient brave! But the seat goes UNDER your seat and it did NOT fit in ours. So I will be needing to get a refund! I was meant to toilet train Aaron in Summer, and because I bottled out, delayed, he is now finding the seat incredibly cold, and the above would not help. Now the beauty of the above is that you get all 3 of those in a set for £9.99. I should have known it was too cheap to work LOL! I did get other bargains in Argos whilst there, which I will save for another blog post. Don't get me wrong, all products are being put to good use, but I won't be blogging about them just yet. Please ignore the dust chalky marks on the floor where my floor polish has one funny. So as you can see the above toilet seat goes OVER ours instead of UNDER like the Argos one. It is cushioned just like I wanted BUT is £16.99. The potty and the stool are each £7.99 so it was one of them I got free. I would have preferred if the stool was a half moon shape instead of round, but I wasn't going to walk away on that basis as I have been putting off this potty / toilet training malarchy for long enough!!!!! I just Googled toilet training for the first time. I had previously been too in denial to even do that. The first thing that came up was this Huggies Pull Ups website. The video is too brief and not at all helpful, but I am delighted by the advice that you CAN train straight through to toilet as intuitively THAT is exactly what I would like to do. You make the transition to the toilet without the middle step of using a potty. Your toddler may feel more like a BIG KID by using the toilet like other members of the family. 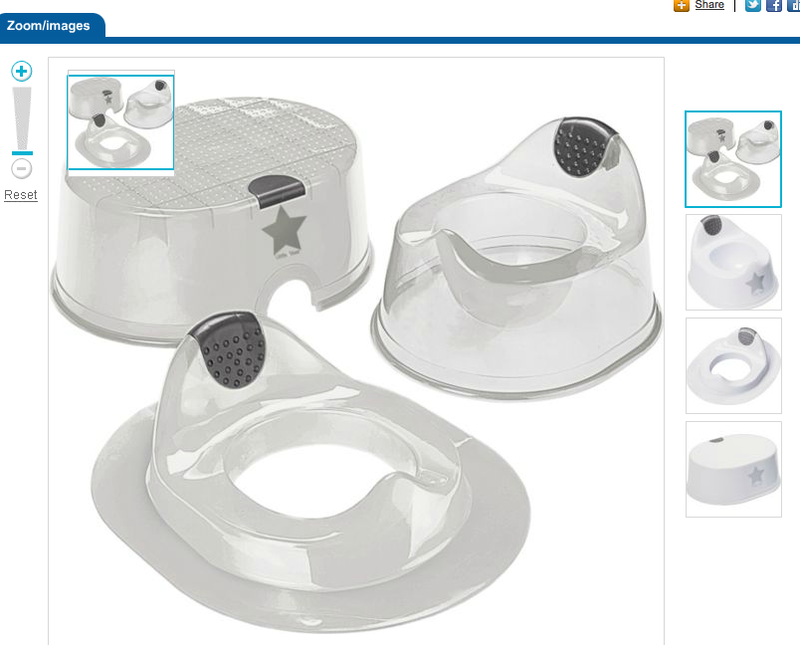 Your toddler will not be so daunted about going to the toilet when out and about without their potty. Toilet seat inserts are lightweight and portable. Anyway, wish me us luck.